Electronero (ETNX) is a privacy centric CryptoNote cryptocurrency whose mainnet first went live on May 30, 2018. At its core, ETNX is a fork of Electroneum – a mobile focused crypto launched back in 2017. Furthermore, Electronero utilizes the Monero source code, and has been reinventing anonymous cryptocurrency by combining the best features of leading CryptoNote coins including Bulletproof RCT’s, adjustable privacy levels, CryptonightFast Proof-of-Work, Camel emission and the M-LWMA difficulty algorithm. There are a great deal of impressive developments under Electronero’s hood which are an immense factor in the cryptocurrency’s price booming beyond 5X since the dawning of the year. As mentioned, Electronero ($ETNX) is a fork from Electroneum which employs the Monero source code. The manner in which the cryptocurrency kicked off is through an airdrop that provided ETNX to users holding Electroneum. On block 307,000 of Electroneum a snapshot was taken of the blockchain and for a limited duration users received ETNX at a 1:1 ratio. One of the key differences characterized by Electronero is the addition of more technical features to the coin such as bulletproof RCT’s, adjustable privacy levels with mixin 1 to 100, Camel emission and the M-LWMA difficulty algorithm. At the time of writing, ETNX is trading at $0.15 with an overall market cap of $1.1m. Much of Electronero’s volume originates from TradeOgre, a relatively new cryptocurrency exchange established in 2018. There are various new developments in sight for ETNX. In November of 2018, the Electronero team announced that they will be performing a hard fork that will create a second coin called Electronero Pulse ($ETNXP). ETNXP was distributed to holders of ETN and ETNX similar to the initial hard fork. One key difference is the new cryptocurrency features a new GPU/CPU mining algorithm called Cryptonight Fast. In January of 2019, the team announced Electronero Classic ($ETNXC), a new crypto and a 1:1 fork of ETNXP aimed to be utilized in smart contracts, unlike ETNXP which is more tailored towards gaming / game contracts. In February of 2019, Litenero ($LTNX) was announced, a 1:1 hard fork of ETNX fit to be the silver to Electronero’s gold. The Electronero team’s strategy of creating different tokens for different use cases is definitely an interesting one. Up to this point we mostly have seen such strategies with NEO and NEO Gas, Vechain and VTHOR, but we haven’t quite seen cryptocurrencies fork multiple times for different use cases. To summarize, at this time there are 4 versions of Electronero: The original ETNX, the complementary LTNX, the game oriented ETNXP, the smart contracts oriented ETNXC. 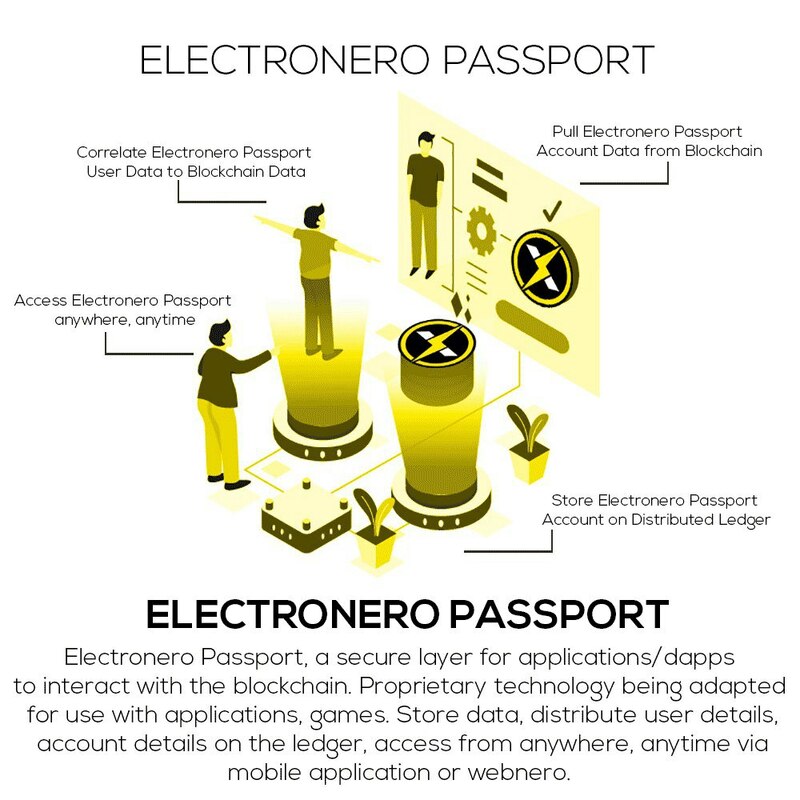 Electronero Passport a secure protocol layer which transports data from users to the blockchain. This is some of Electronero’s major league tech, that catalyzes the entire project to further enable dapps/apps to use the Electronero blockchain to interact with and store users data. Electronero Passport is in use today in production with the following highly available d’apps: Electronerobot Telegram/Discord Social Wallet Bot, Electronero Mobile Application for Android and iOS, Webnero graphical web interface and more. If you would like to participate in the ETNX economy and mine the cryptocurrency you have a few options. You can solo mine or join a mining pool. If you don’t have a significant amount of power it’s always recommended to join a mining pool as your rewards will be more steady. There is a list of mining pools on the Electronero website which you can choose from. Next, you need to download the mining software itself which is called xmr-stak, xmrig, as the name suggests it’s similar to the mining software that is used by Monero. Once you download the miner you need to launch it and connect to a pool. This is the same way most cryptocurrencies are mined these days, so if you’ve mined altcoins before you shouldn’t have any problems setting up ETNX mining. To begin mining Electronero, check out the Getting Started page on Electronero’s official USA mining pool. Electronero also has both iOS and Android mobile wallets which you can download from the respective app stores. One of the latest developments for Electronero is their partnerships with top volume producing exchanges with P2PB2B – a brand new cryptocurrency trading platform with daily volume exceeding Ƀ111,521.11 and Bitker – a Singapore based exchange originated in 2017 with daily volume exceeding Ƀ59,804.54, According to the core team they received approvals for listing on their platform and soon will move with the official listing. It’s great to see a cryptocurrency project that has so many developments going on. Electronero is definitely a next generation cryptocurrency not only because it is based on CryptoNote, a futuristic distributed ledger technology, but also because of all the features that their blockchain offers. The infrastructure for the coin is up to current standards with both iOS and Android wallets and the fact that the team listens to their community and adjusts accordingly is a huge bonus. Overall Electronero is still in its infancy as the cryptocurrency is nearly celebrating its first year of mainnet operations, however the amount of developments that were accomplished in that period of time is astounding. If you would like to hop on board and join their community visit the official Electronero website join the official Telegram and official Discord. Disclosure: This article is sponsored by the Electronero team.